Amit Kumar Dhankar picked up India’s second gold medal as the hosts put up their best-ever showing at the 26th Asian Wrestling Championship at the KD Jadhav Stadium in New Delhi on Monday. Grappling in the men’s 66-kg freestyle category, Amit, an eleventh hour replacement for London Olympics silver medallist Sushil Kumar, got the better of Mongolia’s Ganzorigiin Mandakhnaran. The Mongolian called the shots early on and won the first period. But Amit levelled things, winning the second period 4-0. The Indian seized the initiative in the third period, gaining a 3-1 lead before holding off resistance from Mandakhnaran to win 3-2 amid loud cheers from the home crowd. Earlier, Amit outwrestled Uzbekistan’s Ruslan Pliev in the semifinal. Meanwhile, India’s main medal hope Narsingh Yadav reached the bronze medal play-off contest through the repechages but could not land a medal in the men’s 84-kg freestyle category. Another India, Praveen bowed out in the quarterfinals in the 74-kg freestyle category. 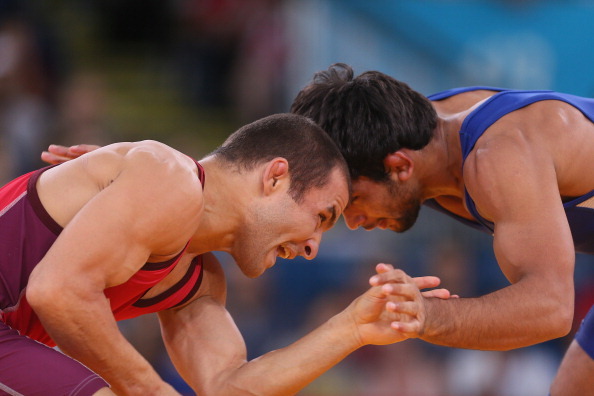 India emerged as men’s freestyle wrestling Asian Champions with 2 golds and 2 bronze medals. India finished with nine medals – 2 gold, 1 silver and 6 bronze – their best-ever display in this continental championship. Earlier, Indian women wrestlers dazzled in this tourney. Navjot Kaur gave the home fans plenty to rejoice about when she bagged the silver medal in the women’s 67-kg freestyle category. The Indian was consigned to the runners-up finish by Mongolia’s Ochirbatyn Nasanburmaa. There was more joy for the country’s women contingent in the 72-kg freestyle category. Jyoti scooped up a bronze in this category. Geetika Jakhar also landed a bronze in the 57-kg freestyle category. Vinesh won a bronze in the 51-kg freestyle division, pipping Thailand’s Sriprapa Tho-Kaew, while Babita Kumari also secured a bronze in the 55-kg freestlye division - beating Liliya Shakirova of Uzbekistan. Indian men also scale new heights in this championship. Talented Amit Kumar scooped up India’s first gold medal in the 55-kg freestyle category, beating North Korea’s Kyong Yang II in the final bout. Another Indian male grappler, Bajrang, who replaced Olympic medallist Yogeshwar Dutt at the eleventh hour, picked up a bronze after getting the better of Japan’s Shogo Maeda by a fall. Hitender gave India another medal – a bronze in the men’s 120-kg freestyle category. Earlier, Indian wrestlers disappointed in the greco-roman category. 2010 Commonwealth Games gold medallist Sunil Kumar Rana bowed out in the bronze medal round in the 66-kg category. Rana, who is also the 2010 Asian Games bronze medallist, went down fighting to Kazakhstan’s Yerbol Konyratov in a tight repechage round contest. Another favourite, 2010 Asian Games bronze medallist Ravinder Singh made a quiet exit from the championship, losing to Korea’s Douk Gil in the 60-kg category. As many as 225 wrestlers from 19 countries, including powerhouses Iran, Japan, Korea, Uzbekistan, Kazakhstan and Mongolia took part in the five-day event. This is the sixth time India is hosting this championship. New Delhi staged the event for the fourth time. Korea topped the medals tally with 5 gold, 2 silver and 1 bronze, followed by Uzbekistan with 4 gold and Japan winning 2 gold, 3 silver and 4 bronze medals.